If you’re like me, you can often get many people emailing you asking for the same information (e.g. passwords to get in to a site that your school subscribes to). Have your Google Apps administrator create a new account (call it something like ‘passwords@yourschool.com’), and then set up the vacation responder in this account with the information that you’d like to provide to everyone. You can customize this so that it only responds to messages from your school’s email domain, solving any concerns about releasing information to external parties. Once everyone in your school is aware of the address to use for this, they’ll be able to get instant access to passwords or whatever other general information you’d like to share without always having to email you. 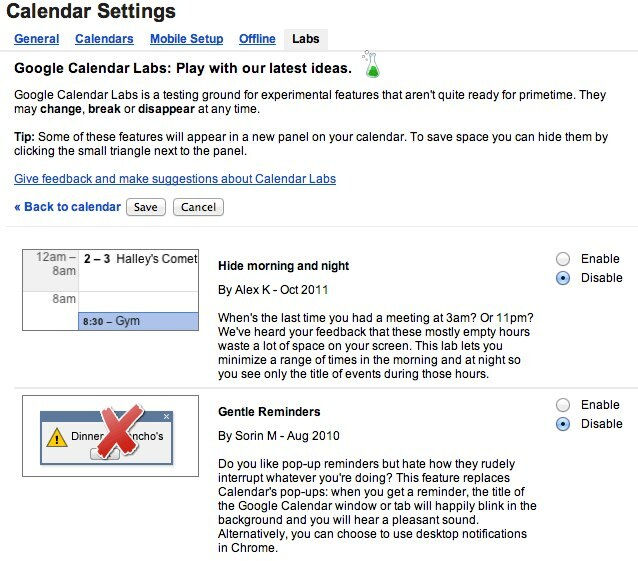 You may have played with some of the experimental labs in Gmail already, but did you realize that there are also great lab add-ons available in Google Calendar? These are experimental features that you can add on to your calendar to better customize it for your needs. Click on the gear icon in the top right and select ‘labs’ to have a look at what’s available. ‘Year View’, ‘Event Flair’, ‘Next Meeting’, and ‘Event Attachments’ are some personal favourites. If you’re using Chrome as your browser, you can add apps to allow access to your Gmail, Calendar, and Google Drive even when you’re offline. You aren’t able to edit things in Google Drive when offline unfortunately, but this is still a handy feature to access your work when you aren’t able to connect (e.g. sitting on a plane). Using the q key as a shortcut allows you to quickly add events to your calendar. Press q and then type your event in the pop up box just as you would relate the information to anyone else. For example, typing ‘Meeting Friday with bobsmith@hotmail.com from 3pm to 4pm’ will create an event in your calendar with all of this information. There are a few tricks to getting the syntax just right, but this can be a great way to create events without searching through your calendar first. That ‘more’ tab at the end of your toolbar list of Google Apps is just waiting for you to customize it. Many products that you may already be using in your school (e.g. EasyBib, BrainPOP) can be added to this list, allowing everyone to access them without needing to enter a password. Ask your Google Apps administrator to add these (in can take a little while to update) after having a look through the Google Apps Marketplace. These are just a few ways of making the Google Apps experience even better. Even if you don’t intend to seek training as a Google Apps Certified Trainer or even the initial individual Google Apps certification, the training materials on the Google Apps for Education Training Center have a wealth of information, and are definitely worth a read.